In this tutorial we will learn about the basics of Digital computers. We will cover Integrated Circuits, Digital Logic family, Encoder and Decoder etc. Complex digital circuits are constructed with integrated circuits. IC is a small silicon semiconductor crystal, called a chip, containing the electronic components for the digital gates. The various gates are interconnected inside the chip to form the required circuit. The chip is mounted in a ceramic or plastic container and the connections are welded to the external pins to form an IC. The number of pins of IC vary from 14 to several thousand. Each pin is identified by a unique number printed on its body. It contains several independent gates in a single package. The inputs and outputs of gates are connected directly to the pins in the package. The number of gates is usually less than 10. It contains 10 to 200 gates in a single package. They perform elementary digital functions such as decoders, adders, registers. It contains gates between 200 to few thousand in a single package. They include digital systems such as processors, memory chips etc. It contains thousands of gates within a single package such as microcomputer chip. It contains hundred of thousands of gates within a single package such as microcomputer chip. IC's are also classified by the specific circuit technology to which they belong. The basic circuit in each technology is NAND, NOR, NOT gates. The earliest logic family was Resistor-transistor logic which used a resistor as input and a transistor as switching device. Diode-transistor logic is a direct ancestor of the Transistor-transistor logic, and used a diode for logic functions while a transistor for amplifying functions. It is the modified form of DTL(Diode Transistor Logic), invented in 1961 by James L Buie. The diodes were replaced by transistor to improve the circuit operation. It is called transistor-transistor logic because transistor performs both the logic fucntion and the amplifying function. 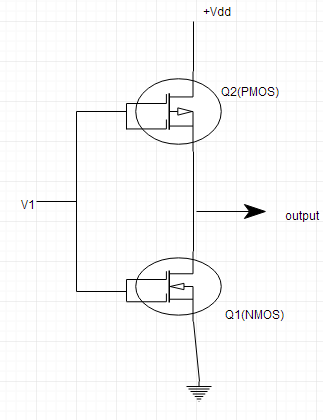 Above figure is two inputs TTL NAND gate with one output. Power dissipation does not depend upon the frequency. 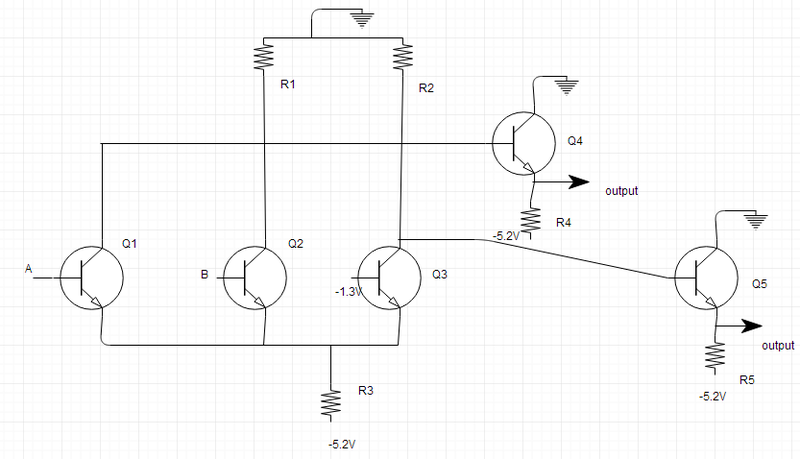 TTL circuits consume more power when at rest(i.e. not being used), but as mentioned earlier, that the power dissipation does not depend on frequency, hence the power speed does not increase with clock speed as fast as for other CMOS devices. Compared to ECL circuits, TTL uses less power but is comparitively slower. TTL is less prone to damage due to electrostatic discharge than the early CMOS devices. Before VLSI devices, TTL circuits were used in the construction of processors for mini-computers and mainframe processors. While in use, many sub-types of TTL circuits were made, like Low-power TTL(less power consumption, but reduced speed), High-speed TTL, Schottky TTL(with improved switching time) etc. It provides highest speed digital circuits. It is used in systems such as supercomputers and signal processors where high speed is required. ECL uses overdriven BJT(Bipolar juntion Transistors) in its circuit. 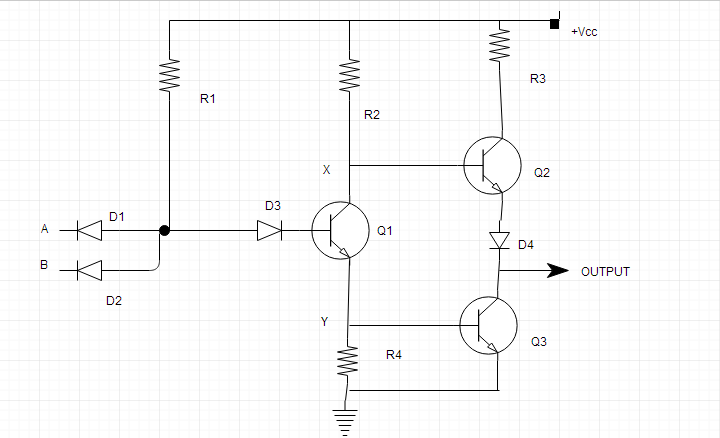 Above figure is two input ECL gate. ECL is the fastest logic family. Propagation delay is very less. In ECL circuit, each gate continuosly draws current even when inactive, hence power consumption is more as compared to other logic families. The large current requirement of ECL is contant and does not depend on the state of the circuit, which is the reason for lower power noise. It depends upon the flow of one type of carriers (electrons or holes). It is basically of two types: PMOS and NMOS. A p-channel MOS is called PMOS and n-channel MOS is called NMOS. Just like any other FET(Field Effect Transistor), they have 4 terminals: Gate, Drain, Source and Substrate. They have four modes of operation: cut-off (or subthreshold), triode, saturation (sometimes called active), and velocity saturation. PMOS transistors operate by creating an inversion layer in an n-type transistor body. This inversion layer, called the p-channel, can conduct holes between p-type "source" and "drain" terminals. Similarly, NMOS Transistors functions by creating an n-channel(inversion layer) in a p-type transistor body. It also falls under the category of MOS, used to construct Integrated Circuits. It uses both P and N channel MOS. It is also known as COS-MOS(Complementary-symmetry metal oxide semiconductor), as it uses complementary and symmetrical pairs of p-type and n-type MOS for logic functions. It is used in systems which require low power consumption. Waste heat production is very less as compared to other logic families. CMOS allows high density integration of logic functions on a chip. A decoder is a combinational circuit that converts binary information from n coded inputs to 2^n outputs. Commercial decoders include one or more enable (E) inputs to control the operation of circuit. The decoder is enabled when E is equal to 1 and disabled when E is equal to 0. Used to implement Boolean functions. An encoder is a digital circuit that performs the inverse operation of a decoder. An encoder has 2^n input lines and n output lines. It converts octal input to binary digits. Fuses optical and digital technology. Can be incorporated into existing applications. Subject to magnetic or radio interference(Magnetic Encoders). Direct light source interference(Optical Encoders). Susceptible to dirt, oil and dust contaminates. 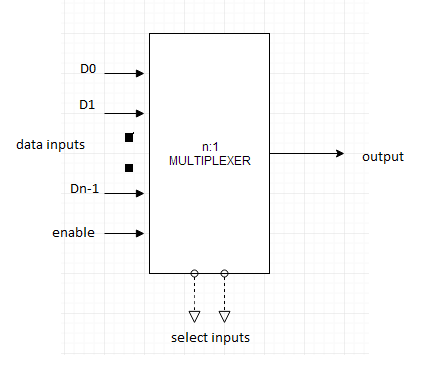 A multiplexer is a combinational circuit that receives binary information from one of the 2^n input lines and directs it to a single output line. It reduces number of wires. It reduces circuit complexity and cost. We can implement many combinational circuits using MUX. It does not need k-maps and simplification. Added delays in switching ports. Added delays in I/O signals propagating through the multiplexer. Limitations on which ports can be used simultaneously. Added firmware complexity to handle switching ports. Extra I/O ports required to control the multiplexer.